We, the United Socialist Party of Venezuela (PSUV) and the Communist Party of Venezuela (PCV), as heirs to the legacy of Simón Bolívar and the struggles of the Venezuelan people in their aspirations for independence, sovereign development, and Latin American integration, subscribe to this unitary agreement, with our commitment to honor each of its sections, in the understanding that the immoral, illegal and criminal interventionist aggression of US imperialism and its European allies against the Venezuelan Bolivarian process is increasing, putting at risk the prospects of national liberation which began with the people’s victory headed by Commander Hugo Chávez in the presidential elections of 1998, and even threatening the national sovereignty and territorial integrity of our country. We, PSUV and PCV, denounce to the World that imperialism, through the U.S. government and with the subordinate complicity of several Latin American governments and of the Venezuelan far-right, insists on manufacturing a cause against our country in multilateral organizations so as to justify an international intervention, with the actual possibility that the right-wing governments of Colombia, Brazil and Guyana may create a provocation on our borders. We, PCV and PSUV, acknowledge that the current crisis of dependent and rentier capitalism of Venezuela has had, and still has, serious consequences for the quality of life of our people, especially in their purchasing power, and the supply of goods and services; that this situation has been aggravated by the actions and policies of imperialism and its local operators, who promote private and public corruption, bureaucracy and the flight of foreign currency in the context of a severe reduction of income from oil exports, all of which are phenomena against which the national government must maintain and deepen a frontal fight, such as that currently underway in PDVSA and other State bodies. We, PSUV and PCV, declare that the way out of the current capitalist crisis should not favor the bourgeoisie and transnational corporations, but the interests of the people in search of a new, post-oil model of sovereign productive development, and should tend towards the leading participation of the workers, peasants, and community and people’s activists within the framework of a broad anti-imperialist front, and towards the establishment of a collective and unified leadership of the political, social, patriotic and revolutionary organizations in order to allow for the joint analysis, construction and coordination of the government’s actions and policies. The magnitude and severity of the current situation and the increase of the class struggle at the domestic and international levels demand an intensification of the immediate actions to be taken in the economic, social and political fields, including emergency measures needed to prioritize people’s demands such as food and health requirements. Such measures would be consolidated with the triumph of the patriotic forces in the next presidential election. We, PSUV and PCV, underscore the importance of strengthening the class-based trade unions and the various expressions of the working-class and revolutionary movement, such as the Productive Workers Councils, Socialist Workers Councils (which would require the approval of a special law as established in the Organic Labor Law), and other forms of organization of the revolutionary workers, with due consideration towards the autonomy of such organizations, and with the development of effective and timely mechanisms and channels so as to enable workers of both the public and private sectors to have a leading role in the development of the social process of work. Taking into account the deepening of the capitalist crisis which affects large sections of the working class, it is important to strengthen and safeguard labor rights and employment protection, as well as expand the policy of creating new jobs. We, PSUV and PCV, will work together, each Party to the extent and scope of its possibilities and characteristics, from the Government and the socio-political spaces we occupy, to identify and tend to the restitution of the infringed rights of workers in cases already raised or that may arise in the public and private sectors. We commit ourselves to immediately review and apply corrections as needed regarding the actions of certain public officials denounced by revolutionary organizations. We adhere to the concept of advancing decidedly towards the reorganization and interconnection of the productive processes of the State-owned companies, some of which must be restructured and strengthened so as to revert their ongoing deterioration that could lead to stoppages which would be damaging for the national productive development. In addition, we commit to protecting and supporting the rural collectives who have reactivated State-owned farms. We, PSUV and PCV, will assess the experiences of workers control, such as the «Plan Guayana Socialista», towards the establishment of a new model of multi-faceted management and direction of the State-owned enterprises under workers’ and people’s control of the processes of production, management, and distribution. We shall do this on the basis of the principles of collective leadership so as to permanently banish the scourges of corruption, inefficiency and authoritarian and undemocratic methods in management. We agree that strong and immediate actions by the National Superintendence for the Defense of Socio-Economic Rights (SUNDDE) and the Superintendence of the Institutions of the Banking Sector (SUDEBAN), in articulation with the people’s organizations, are needed in order to protect the rights of millions of users of the banking system, particularly workers, pensioners and small entrepreneurs. We consider relevant and urgent the adoption and strengthening of actions aimed at dismantling the power of private monopolies, defining and promoting policies to achieve sovereign national productive development, and to punish corruption, price-gouging and mobster activities. We commit to prioritize formal employment with its corresponding labor rights, as an activity that dignifies the human being; therefore, we commit to strengthen wages and restore their position as the main component of the income of the workers. We, PSUV and PCV, in bilateral and regular meetings, will discuss strategic proposals that are being raised by PCV with the aim of helping in the development of State and Government plans and policies for the benefit of the people and national liberation. 15.1. The topics to be discussed further, include, among others, the banking and financial systems, foreign trade, public finances, and the tax system. We, PSUV and PCV, will identify common areas of action, in order to strengthen both our political activities and our organizations. 16.1. We, PCV and PSUV, will hold bilateral meetings at least once a month, as per an agreed-upon schedule, between representatives of both national leaderships. 16.2. We, PSUV and PCV, will follow up regional and municipal efforts to develop effective policies to tend to the most pressing needs of the population. 16.3. In the international arena, on the basis of the established areas of action and influence of each party, we will strengthen relations with those entities and organizations that have demonstrated consistent solidarity with Venezuela and the Bolivarian process. 16.4. In the area of production, we will support proposals and projects in manufacturing and agro-industry, with particular emphasis on all initiatives stemming from the communal and peasant movements. 16.5. We, PSUV and PCV, commit ourselves to the strengthening of the labor and trade union movement, contributing to the communication between class-based and revolutionary tendencies and State entities, so as to seek solutions to conflicts and disputes that may arise; we also make a commitment to respect the rights of workers. 16.6. All projects related to audio-visual and printed media stemming from our organizations and people’s and workers’ movements will be supported, within the framework of our cooperation in the ongoing media war and against psychological operations. 16.7. Both parties will foster relations between their youth branches, the Youth of the United Socialist Party of Venezuela (J-PSUV) and the Communist Youth of Venezuela (JCV), through projects related to student, cultural, sporting and community-based activities, as well as those for the defense and strengthening of the rights of young people. 16.8. 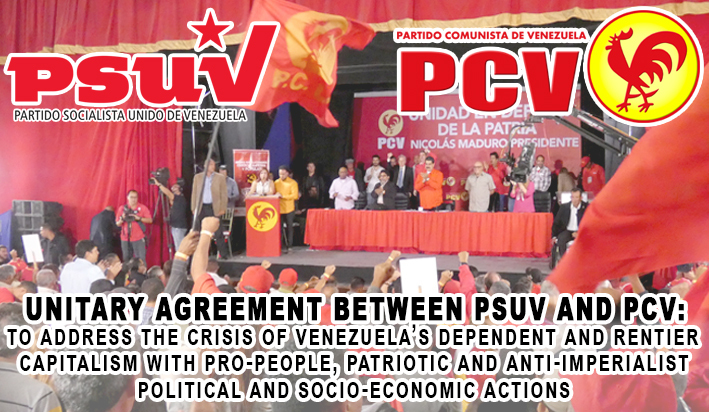 In order to advance the development of the alliance between PSUV and PCV and the people’s revolutionary movement, we will strive to build unified candidacies in upcoming elections, so as to ensure an effective presence and the strengthening of both our organizations in legislative elections at the national, state and municipal levels. PCV, on the basis of this accord and the several other points of agreement with PSUV in areas of domestic and international politics, embraces the candidacy of compatriot Nicolás Maduro Moros, head of a wide coalition of social and political forces –from which the collective and unified leadership of the process should emerge–, as the advocate of the aspirations and struggles of our people against imperialism, for Latin American unity and for the national sovereignty and development of our country. Therefore, we will strive together, with due respect for the autonomy of each party, so as to achieve an overwhelming victory in the upcoming elections of April 22nd, 2018. Two identical copies of this agreement have been drawn up.